Posted on April 16, 2013 by admin in Attractions, Blog. Amman is the capital and largest city in Jordan. 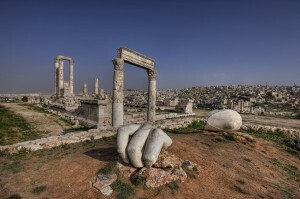 Amman serves as the country’s cultural, political, and commercial center. It has a long history and was inhibited by several civilization. During 13th century BC, Amman was called Rabbath Ammon by the Ammonites. It was later conquered by the Assyrians, followed by the Persians, and then the Macedonians. Ptolemy II, the Macedonian ruler of Egypt, renamed it Philadelphia. The city became part of the Nabatean Kingdom until 106 AD when Philadelphia came under Roman control and joined the Decapolis. You can start your tour by visiting the Amman Citadel, also called Jabal al-Qal’a it was occupied as early as the Neolithic period, and fortified during the Bronze Age. Here you can see ruins from the Roman through early Islamic Era. * Umayyad Palace Complex built between 720-750 AD. * Temple of Hercules built between 161-180 AD. * Byzantine Church built between 6th or 7th century AD.